Research and Markets has announced the addition of the "Brazilian Digital Signage Services Market" report to their offering. 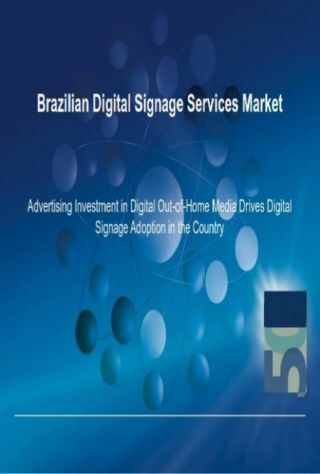 This research service presents analysis of the current ecosystem of the Brazilian digital signage services market. It comments on the emerging trends and presents case studies for different digital signage service initiatives. - As brands and advertisers realize the inherent shortcomings of traditional media, they are investing in newer marketing vehicles, like digital signage, due to its ability to reach huge audiences and play engaging and targeted messages to them at the point of sale, point of transit, or point of wait. - Marketers are keen on creating unique and sophisticated customer experiences in-store. This has led to significant interest in digital signage as an effective medium for both advertising as well as superior shopper engagement. When executed properly, digital signage can communicate the call to action clearly and accomplish the desired objectives of the network. - Even though the digital signage ecosystem is quite complex - including display vendors, software companies, media player manufacturers, ad agencies, AV integrators, and tech support services - the emergence of affordable turnkey bundled solutions as well as integrators who take charge of the entire deployment from concept to ongoing maintenance has driven interest across all segments of the market. - However, even though the Brazilian digital signage market is growing as hardware vendors (e.g. Samsung, LG, and Philips) drive this adoption, it is a less penetrated country when compared to countries in Asia, the United States, and Western Europe. Thus, Brazil represents an important growth opportunity for the industry.